† Vertical or Horizontal overprint. ‡ Scott  lists both the French and Italian issues serially under Casterllorizo. Gibbons lists them separately in Parts 6 and 8 of the catalogue. 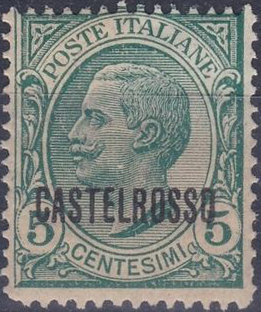 Scott  states that, "Formerly a Turkish possession, Castellorizo was occupied by the French in 1915 and ceded to Italy after World War I. In 1945 it became part of Greece", along with the Dodecanese Islands. Gibbons  elaborates that it first used French o/i Lavant stamps with special cancellations, then overprints from 1920. B.N.F. = Base Navale Française. 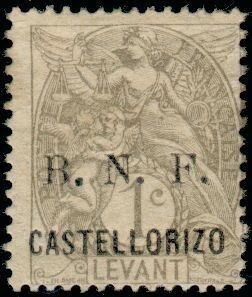 Later overprints were inscribed O.N.F. for Occupation Navale Française and O.F.,Occupation Française . Sources: ScS , SGP6 , SGP8.